On this Memorial Day, I remember all of the Norwegians who fought in the American Civil War. YES--Norwegians, who had not yet been naturalized as American citizens. 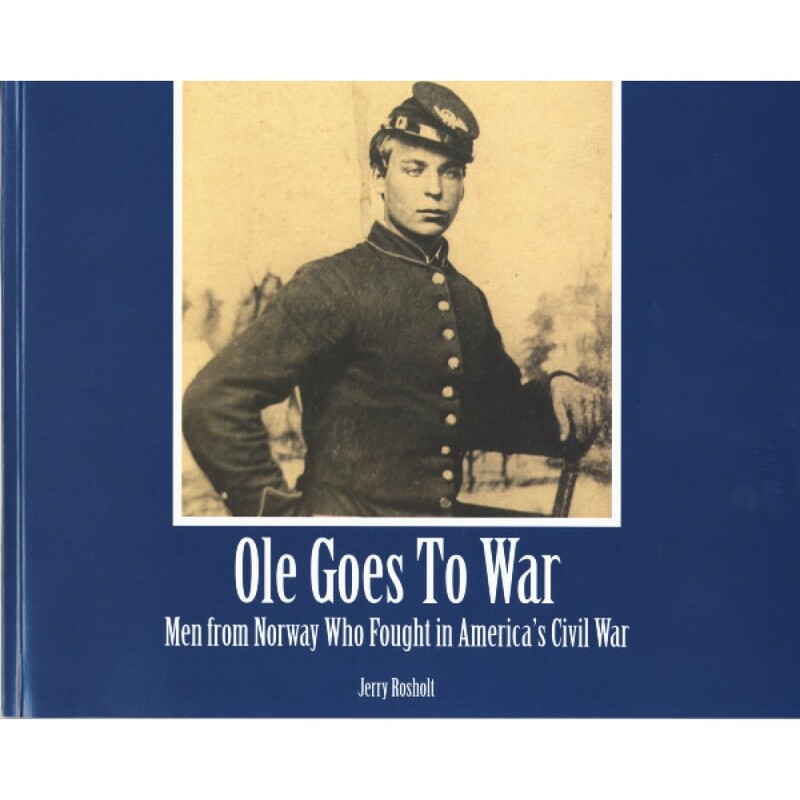 "One of every six Civil War soldiers born in Norway were named Ole"
In 1996 Darell Henning, curator of Vesterheim Norwegian-American Museum, asked Jerry Rosholt to compile a database of Norwegian immigrants who fought in the American Civil War. Jerry accepted the challenge and spent nearly the rest of his life dedicated to this project. "At least 6,500 Civil War Union soldiers were born in Norway...and an estimated 300 Norwegians served in Confederate units." Jerry was a tenacious and thorough researcher, and used multiple resources in documenting his findings. He brought his reporter's sense of accuracy and his talent for storytelling to bear on one of the pivotal moments in American -- and Norwegian-American -- history. The book he penned tells the story of not only the famous, such as Colonel Hans Christian Heg, but also the many, many other Norwegians who stepped forward to serve their new country. Many have heard of Colonel Hans Christian Heg, the commander of the all-Norwegian Wisconsin 15th regiment. He was respected by his men for his fairness, his courage, and his confidence during the most dangerous battles. Hans Heg was born at Lier, near Drammen, Norway on December 21, 1829, the eldest son of Even and Sigrid. When Hans was 11 years old, his family came to America, settling in Norway Township, Racine County, Wisconsin. Although I'm not a direct relative, I'm well familiar with the Heg family because my mother's Hegg ancestors were also from Lier, emigrated at about the same time as the Hegs, and also settled in Wisconsin. They were neighbors and peers of the Heg family. Colonel Heg also has a connection to the Pacific Northwest. His youngest child, a son named Elmer Ellsworth Heg, was born in February 1861 and was just two years old when his father was killed in the battle of Chickamauga on September 20, 1863. Elmer went on to achieve a college education, and re-located to Seattle in 1888, becoming a well known physician who specialized in pulmonary diseases. In the early 1900s, he owned a home on Seattle's prestigious First Hill. That property is now on the National Register of Historic Places. The book provides in-depth coverage of the soldiers who served in the Wisconsin 15th regiment, the lives they led in the ranks of the Union Army, and their fates during the war. It also tells of the 111 Union soldiers, born in Norway, who became prisoners of war in the infamous Andersonville prison in Georgia. It provides a list of these men and where they enlisted. Rosholt takes it a step further, and shares individual soldiers' lives with the reader. "Perhaps more telling than vivid descriptions of battles, or long lists of those who fought and died, are the personal stories of men and women who immigrated to a New World only to be caught up in a civil war unparalleled in history." Here are the love story of Ole Anderson and Mary Katterud; the life of Ludvig Bjorn, a pastor ordained in Norway; the tale of Knud Hanson, who was drafted in 1863 and died in Andersonville a year later; the story of Jens S. Jensen, who was from Bosque County, Texas and served in the Confederate Army; and many more. The book is also enriched with extracts from diaries, letters, and journals. Finally, there is a database of over 10,000 Norwegians who fought in the Civil War. There are fourteen pages of brief synopses that focus on individual soldiers: snapshots of who they were, where they came from, how they served, and where they ended up following the war. From ANDERSON to WROLSTAD, the book shares the story of men who fought hard and long in a war that changed history. 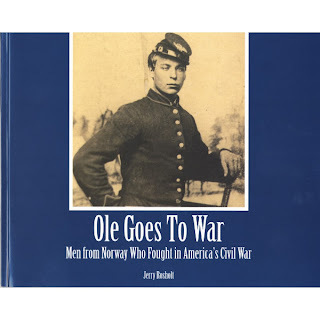 The book 'Ole Goes to War' can be purchased for a very reasonable SALE price of just $5 from Vesterheim. I recommend you add it to your library, if for no other reason than to acknowledge these soldiers who served this country. What makes this even more desirable is that Vesterheim has maintained on online database where you can search for possible Norwegian and/or Norwegian-American ancestors who served in the Civil War. Norwegians in the Civil War is simple to use. You can even 'just browse,' if you aren't sure what name to look under. Let me leave you with this. We owe a great deal to the men and women who have made the U.S.A. a place of freedom and possibilities. Our ancestors fought hard and long to make the life we are privileged to live: one that would make them smile. Jerry (Jerome Karlton) Rosholt was born to Carl and Edith (Solem) in January 1923 in Glasgow, Montana. He attended public school in Alexandria, Minnesota, and graduated college in 1948, with a degree in speech and business administration from Luther College in Decorah, Iowa. His college years were interrupted by World War II, in which he served with the 95th Infantry Division. After graduation, he worked as a news reporter in Philadelphia (WRCV-TV), in New York City (WNBC), and for the Huntley-Brinkley Report, retiring from this role in 1988. In September 2006, Jerry was awarded the St Olav's medal by King Harald V of Norway "in recognition of [his] great services to Norway, in particular [his] active involvement with the Vesterheim Norwegian-American Museum on its Civil War project." The medal was presented October 21st, 2006 in Decorah, Iowa, by Norwegian Consul General Rolf Hansen. My friend Jerry passed away on Friday April 4, 2008 at the age of 85. He was survived by his three sons: Rhys, Dirck and Cort. However, his military service to our country, and his tenacious work on identifying Norwegians and Norwegian-Americans who served their new country, will forever be his legacy. "Historians, genealogists, Civil War buffs, and most of all, Vesterheim, are forever in his debt." Syver are related to my grandfather,on my fathers side. He is from Hol in Hallingdal. I have been doing quite a lot of research on the 12th Iowa, where Henry Steen served. Do you have any family information on him other than what can be found in already existing sources? I have specifically looked at two brothers from Nannestad, Norway by the name of Hans and Olans Hanson, and hope to find references to these two men through others who fought with them. John and Henry Steen fought with Hans and Olans for 3 years, among other battles in the Hornets' Nest at Shiloh. Yes, I'm familiar with the Steen brothers, I have a good friend and fellow Nearby Norwegian who is also related to the Steen brothers. I highly recommend a book that I recently discovered titled "A Perfect Picture of Hell: Eyewitness Accounts by Civil War Prisoners from the 12th Iowa" by Hugh H. Genoways. It was published in 2001 by the University of Iowa Press. It provides first person accounts from the men that experienced the war through the lense of the soldiers themselves. In their own words. It's simply fantastic. I also have begun a list of Norwegians that served in the 12th Iowa and have written an article about unit for the May 2018 issue of the BREV, a newsletter of the Ringerike-Drammen District Lag. You can read when it comes out next month. Yes, the Steen brothers and well as 9 Hanson's are part of this unit.